After our two-week road trip around Italy last year, we fell in love with the country and couldn’t wait to go back. 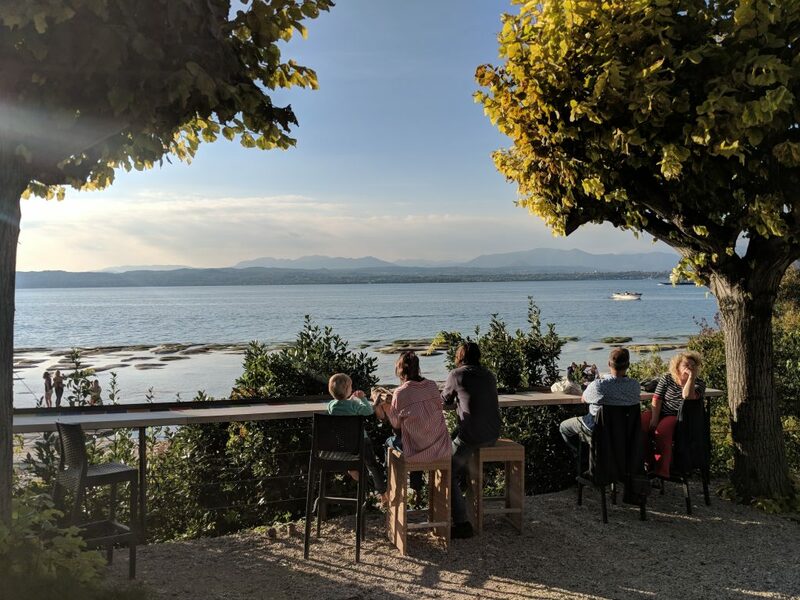 This time, we wanted to concentrate on a specific area and started looking into where to go in Lake Garda – somewhere I have always wanted to visit. With a bit of research we discovered that we were able to base ourselves in one place yet be able to explore the whole lake. 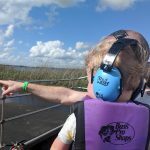 This appealed to us as we love road trips and the chance to see a range of different towns / villages on one holiday, but for this trip we wanted somewhere to unpack and call home for the week. 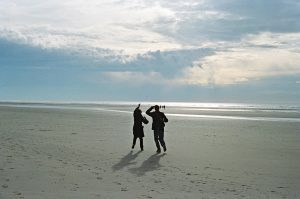 We also had our 21-month old son with us, so less time in the car and more opportunity to stretch our legs was a must. 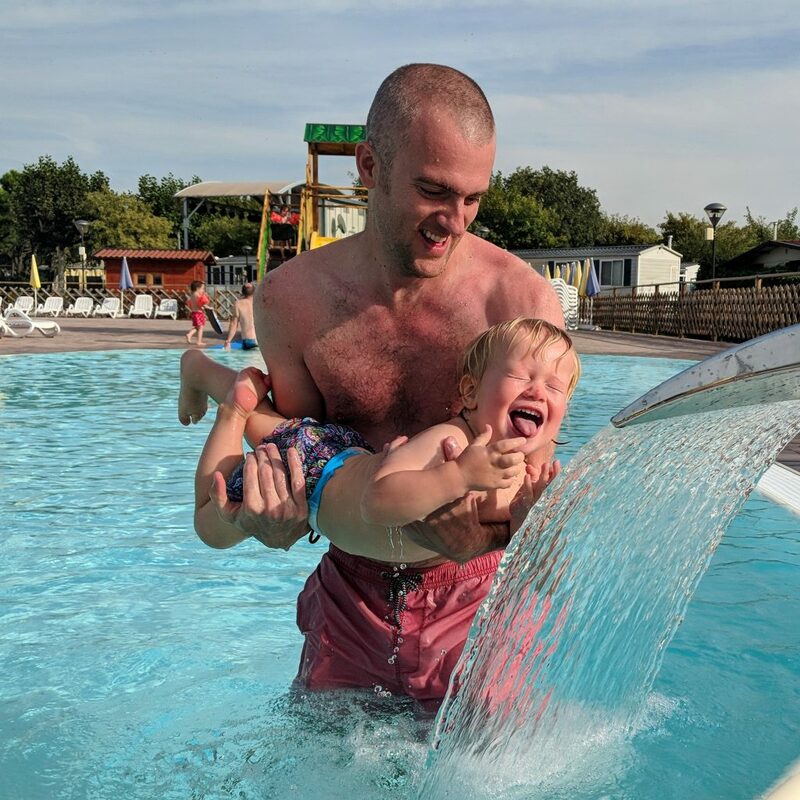 Luckily there was no shortage of things to do in Lake Garda. For more Italy inspiration, read our reasons to travel Italy by campervan here. 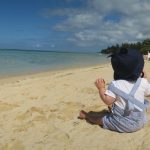 Taking your baby on the plane for the first time? We answer all your questions. 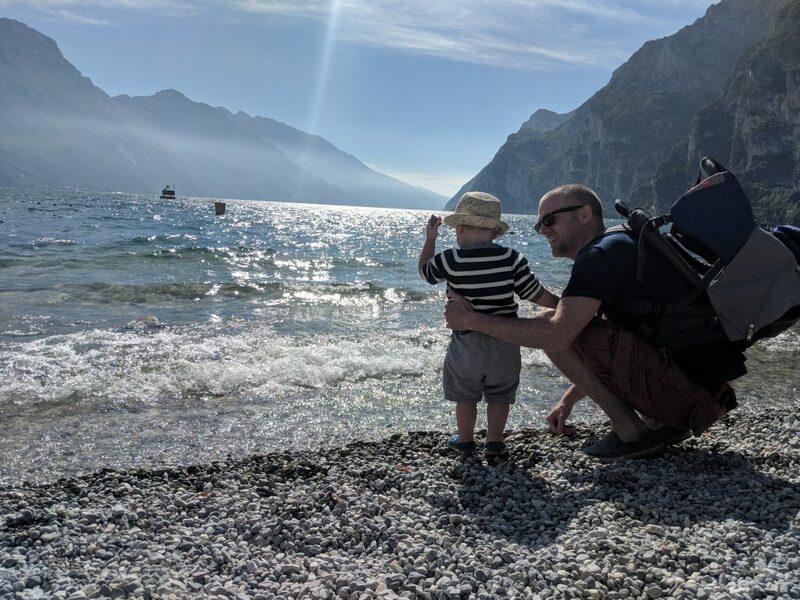 With a short flight from London to Verona (Just 1hr-40 mins on easyJet and we paid £98), and then a 20-minute drive to the lake, Lake Garda turned out to be the ideal place for a short trip to Italy. Lake Garda is the largest lake in Italy (910 square miles) and around the lake are 19 or 20 small villages. 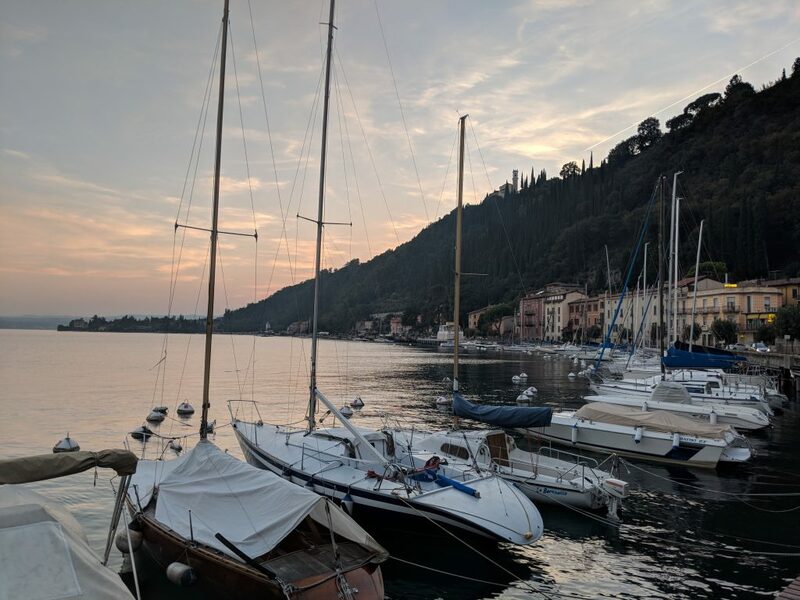 In the post below I suggest a broad Lake Garda itinerary and detail the main towns and villages you should visit along with some top tips and our favourite stops along the way. 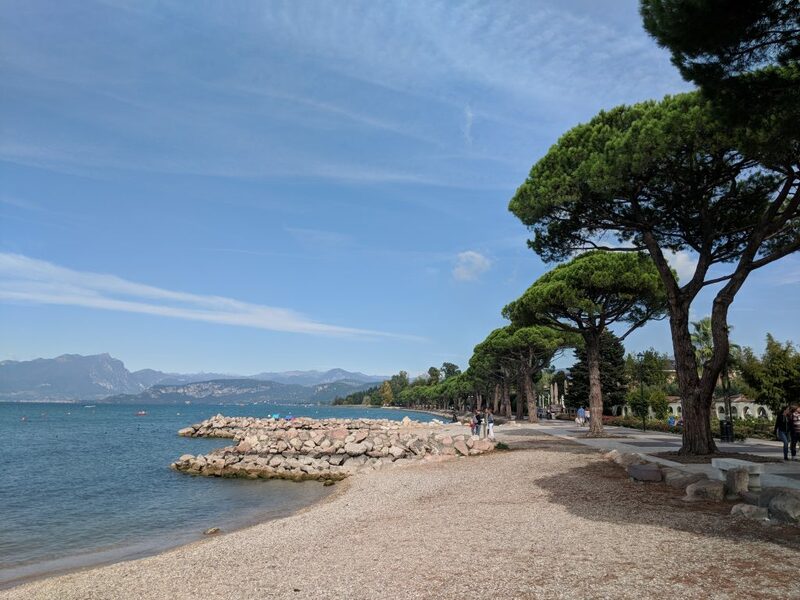 If you are wondering how long you need in Lake Garda, we did this trip in a leisurely six days (throwing in a few beach / lazy days) but the lake can be well-visited in three or four days if you have a shorter trip planned. 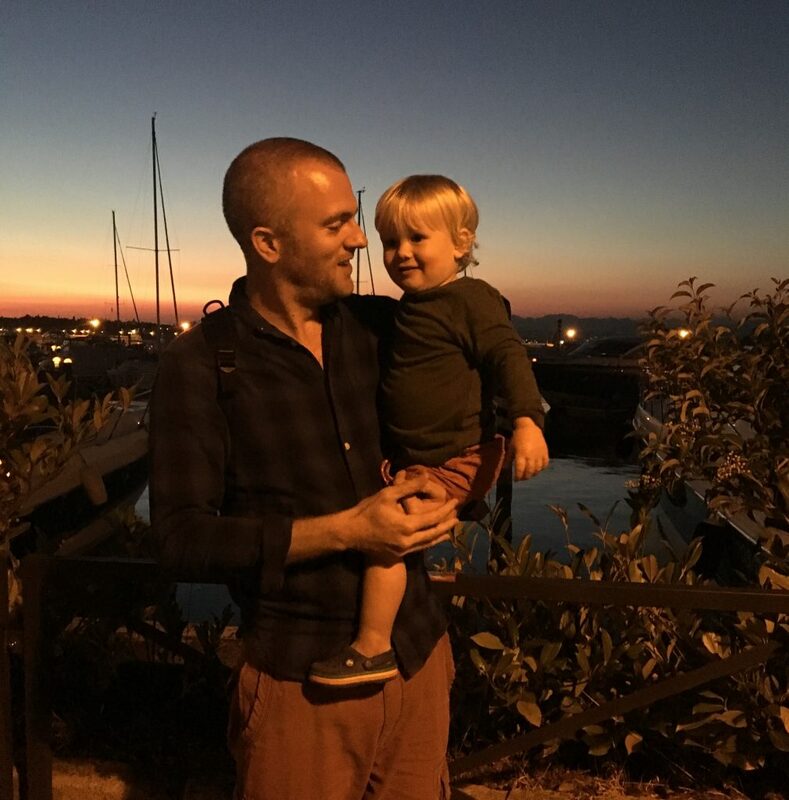 How long do you need in Lake Garda? Three days. (Six days to see the lake at leisure). Because we can’t sit still for five minutes, we actually did move accommodation on this trip, choosing two locations and staying in each for three nights. 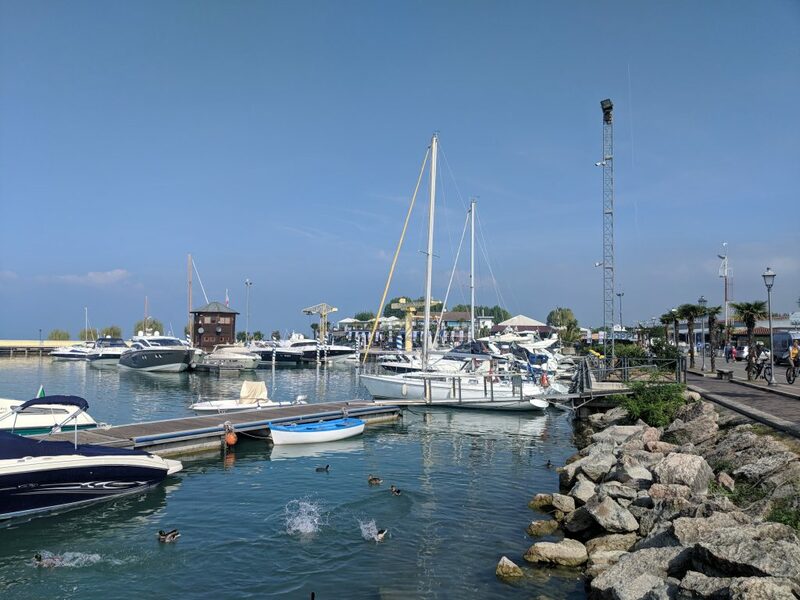 Our first stop was the fishing village of Desenzano del Garda. The three-star Hotel Benaco (booked through Prestige Holidays) was £83 a night. 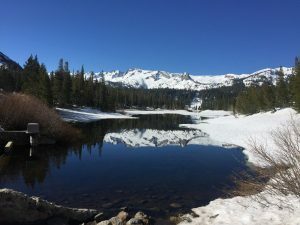 The south-west corner is a lesser-explored part of the lake and so there are some really good deals available. 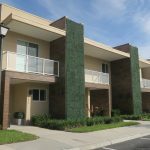 I was impressed with this hotel, which had spacious rooms, nice décor and pretty gardens. There was a huge pool but as we visited in October, despite being very sunny, it was a little too cold to use. We also had a lovely big balcony with views of the lake. 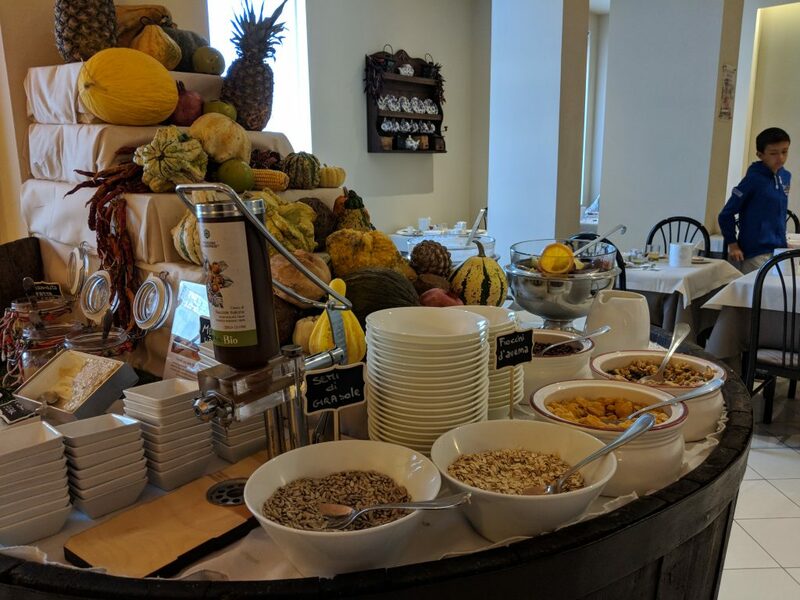 A decent breakfast was included and it was only a five minute walk from the hotel to the harbour. Watch our three-part Italy VIDEO, including Venice, Rome, Cinque Terre and Tuscany. Exploring the lake is really easy. 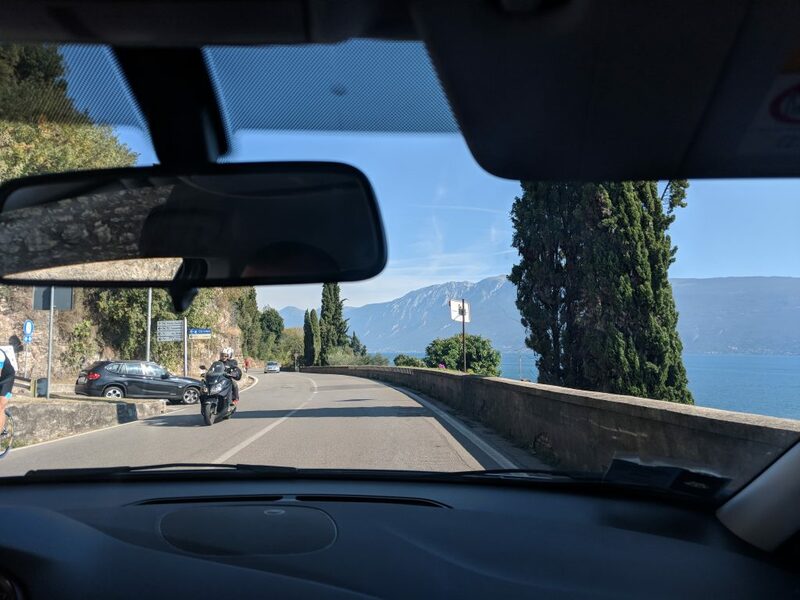 We’d hired a car, and the drive around the whole of Lake Garda is around 95 miles. If you wanted to do this without stopping (not recommended) it would probably take up to four hours. The road that circles the lake is typically Italian – narrow single lane and relatively slow moving with a lot of roundabouts. Going through each village you will meet a bit of traffic as people decide where to turn off or look for parking spots. Considering some of the villages are really small, parking in Lake Garda isn’t too bad. Free street parking is available but you can spend ages finding a space and you’d better be good at reverse parking into tiny spots! We stuck to official car parks and parking was relatively cheap (average 1 Euro per hour). 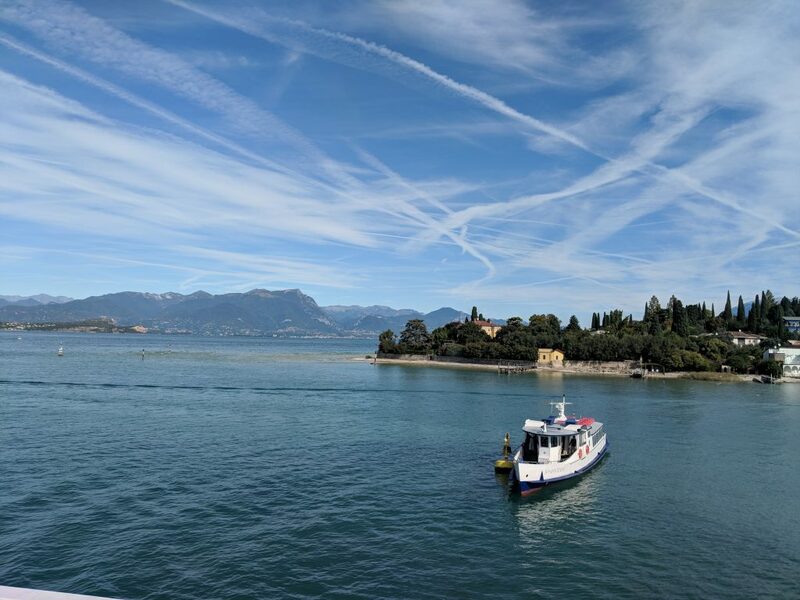 It is also really simple to travel across Lake Garda by boat (obviously this also means you can drink as much wine as you want in the villages as you go around it too!). 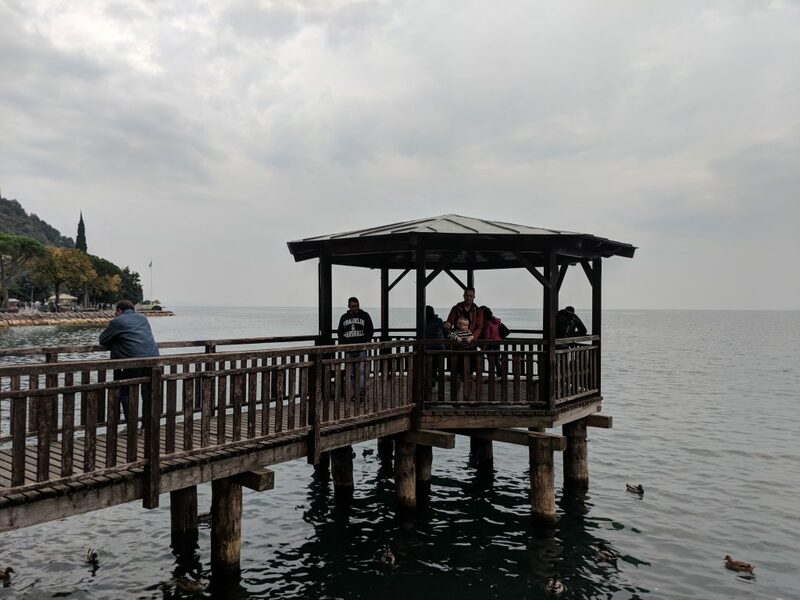 The government ferry service is called Navigarda and covers the whole of the lake, but services vary during high and low season. Since we were boarding at Desenzano, we decided to explore the south of the lake by ferry. At the time of our visit, the price for the south lake service was 24 Euro and you can travel as much as you want for the day. You don’t need to book in advance, just turn up and there is a cashier at the end of each pier. This route made stops at Salo, Sirmone, Lazise, Peschiera, Bardolino and Garda. For the full lake service (which only had two round trips during low season and included Limone, Riva and Malcesine) the cost was 37 Euro. 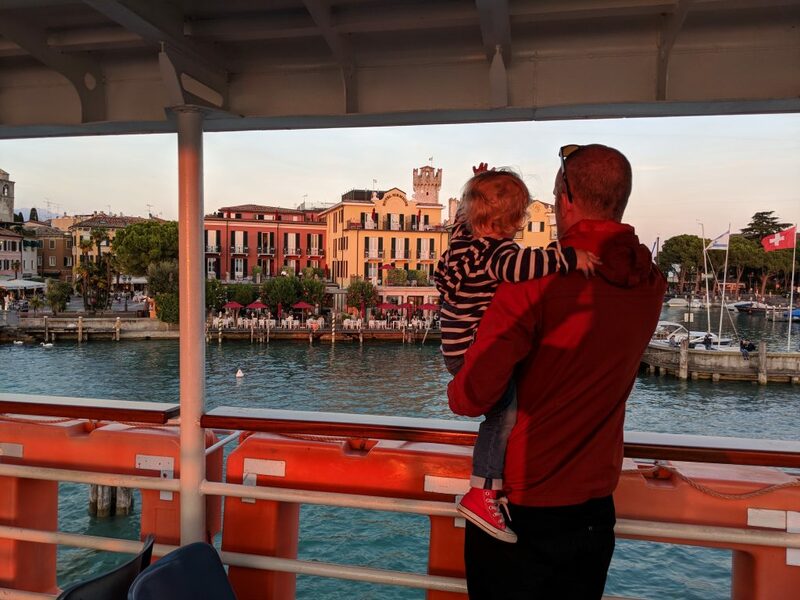 We took the ferry from Descenzano and decided to stop at Sirmione and Lazise. 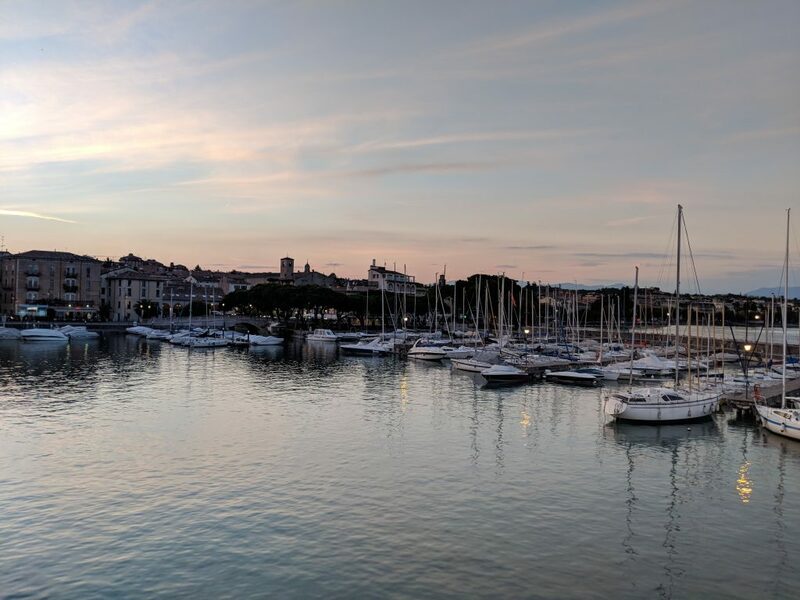 As a guide, we wandered around Desenzano from around 9am, boarded the ferry for Lazise at 11am and took the ferry home from Sirmionie at 7.15pm, allowing around 10 hours for the three towns. This allowed us to explore the villages at leisure with comfortable time to travel between each on the water. 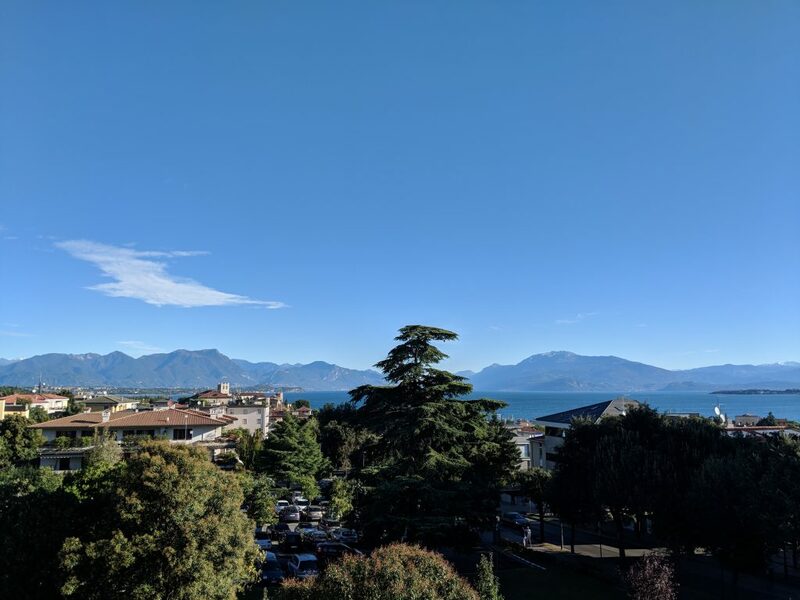 I was surprised to find that Desenzano is the biggest of the Lake Garda towns. 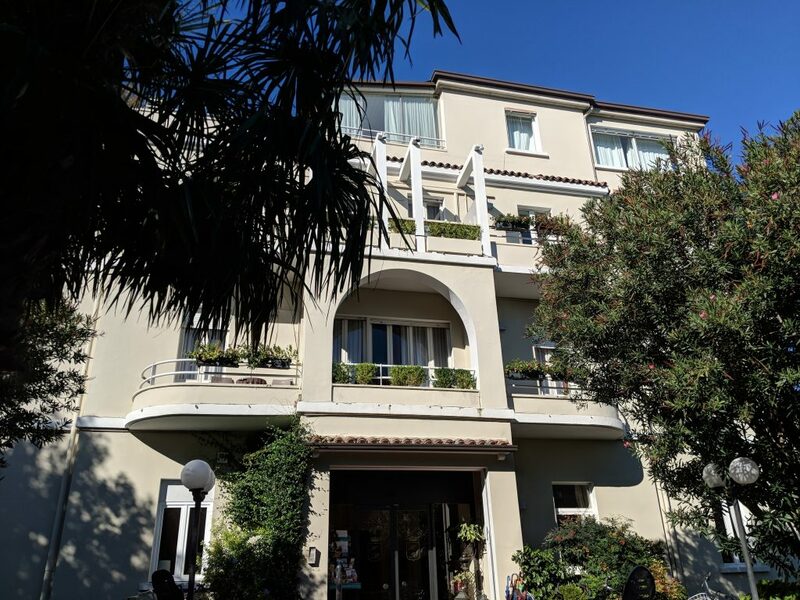 When we first arrived it felt quite cute and cosy but once we started exploring, we found it had a very local vibe with a busy market, a choice of large supermarkets and the Le Vele shopping centre. 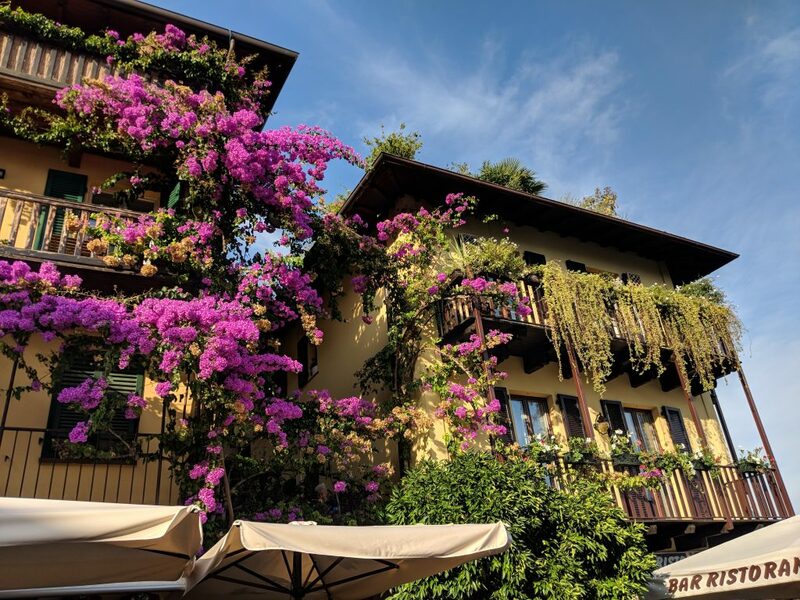 It is definitely a locals village as opposed to a tourist hub but makes for a lovely morning wandering around and getting a feel for life on Lake Garda. Even the cafes and restaurants in the fishing harbour were packed with locals and the menu and prices reflected this so it is an affordable and pleasant place to enjoy coffee or lunch in the sun. 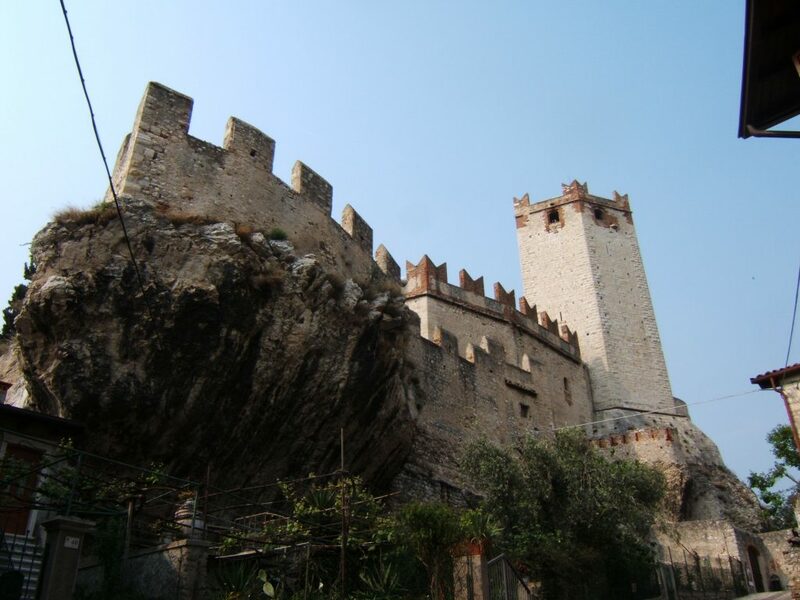 For tourists wanting a bit extra, the Castello di Desenzano (entrance 6 euro per adult) is a 15 minute walk uphill. To be honest, there isn’t much to see inside and I preferred exploring the town and people watching along the harbour. 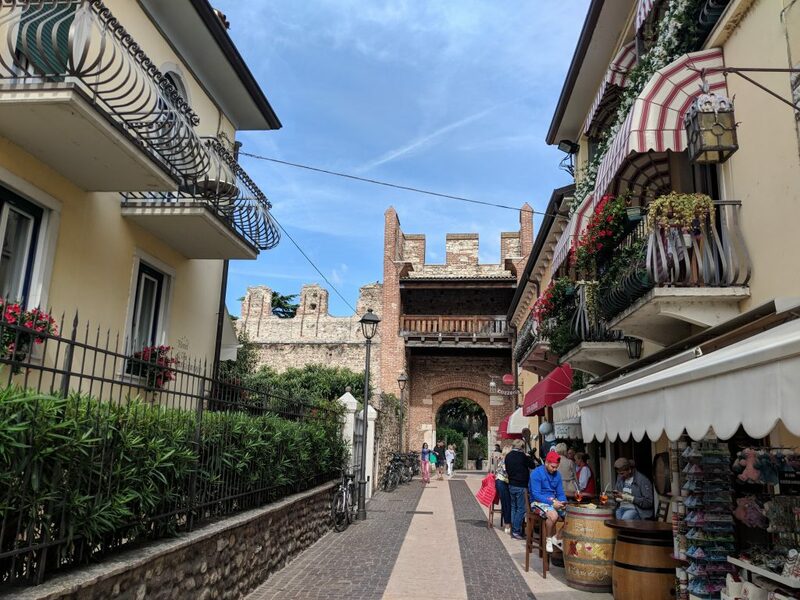 Beautiful Sirmione was one of our favourite towns but it’s the opposite of Desenzano because it is packed with tourists! 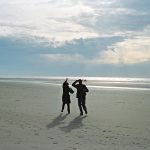 However, there are parts to discover and ways to visit without getting mowed down by coach trippers. 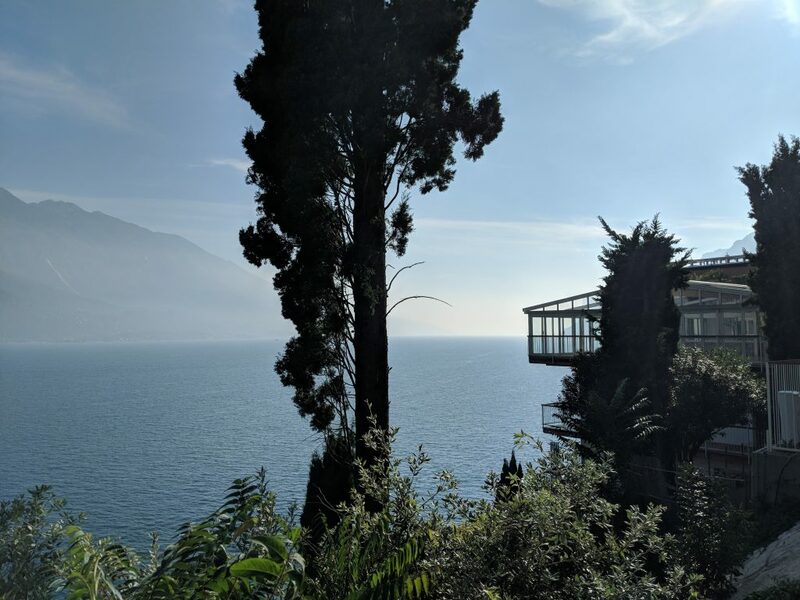 This village is set out on a peninsula that stretches into the lower lake and is surrounded on all sides by a pebble beach and stunning views of Lake Garda. 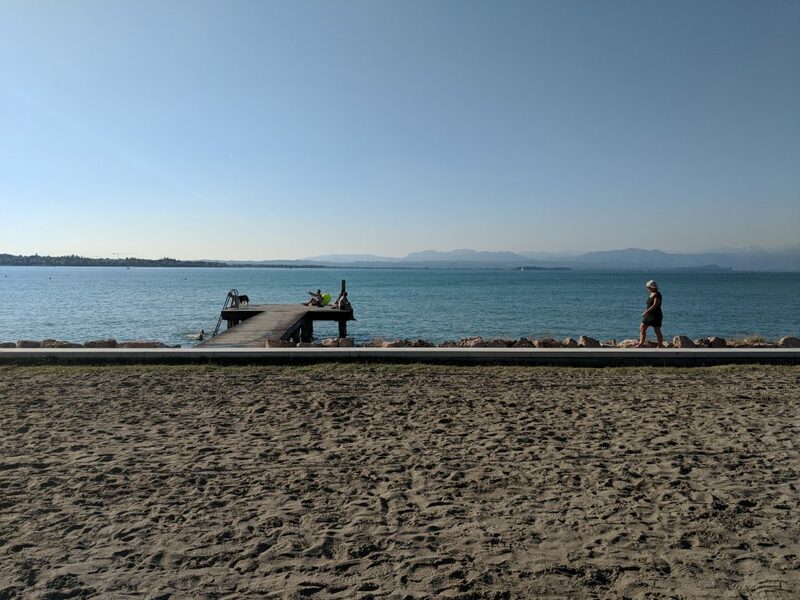 I think my favourite thing about Sirmione was walking from the castle grounds on the east side, around the peninsula following the water edge, playing on the beach and stopping for a snack or a drink along the way. This peaceful and serene part of Sirmione felt like a totally different place to the busy town centre! One of the reasons for this is because the walking route isn’t totally accessible. The coastal path is uneven and part of it involves climbing over small rocks, a gravel track and ancient stone staircases. This means it isn’t recommended for those with limited mobility and prams are not ideal either. 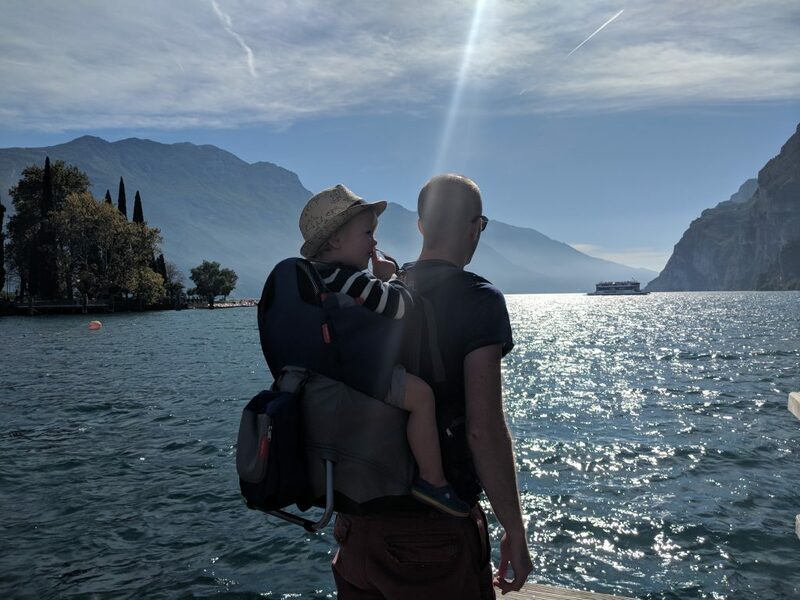 We have a GB Pockit+ buggy that folds into a bag which was the perfect companion, but if you do have kids with you, larger prams that aren’t easily carried would be a real hassle. 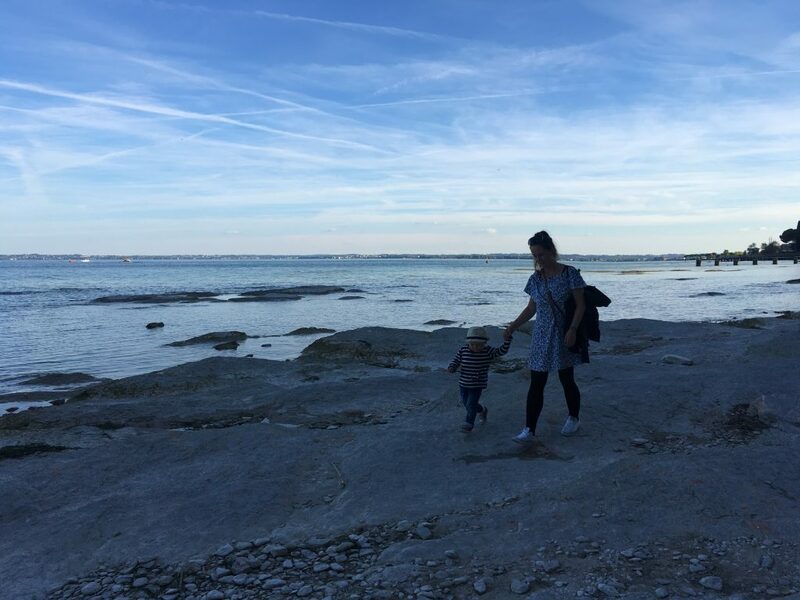 However, this area of Sirmione is perfect for children and Finn loved playing on the rocks and splashing in the shallow water. 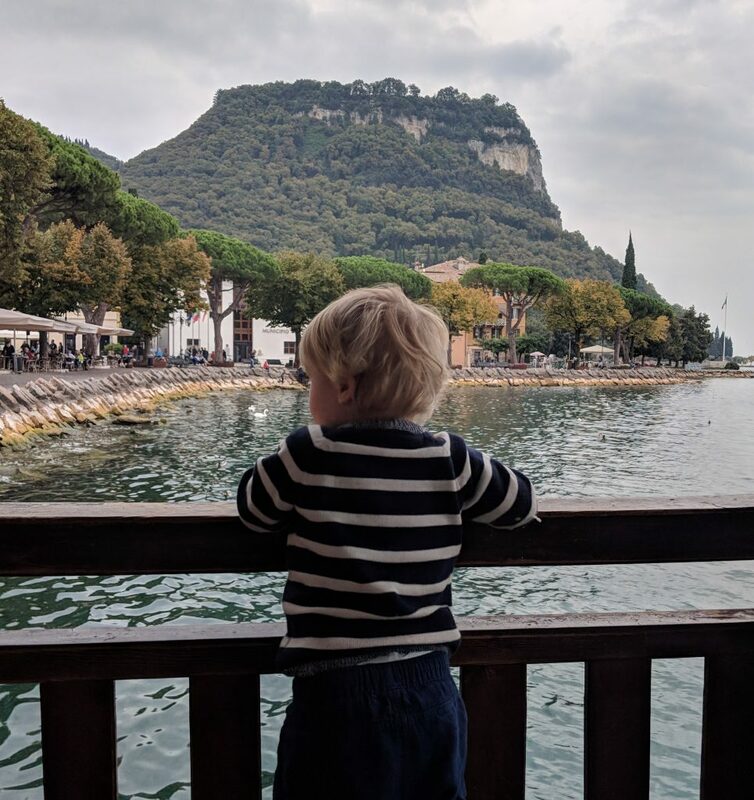 Without an energetic toddler in tow, Sirmione would have been incredibly romantic. At the end of the peninsula there is a beach bar playing laid back music and serving Campari as the sun goes down. 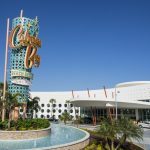 There are also secluded areas and places you can have a little bit of the ‘island’ to yourself. 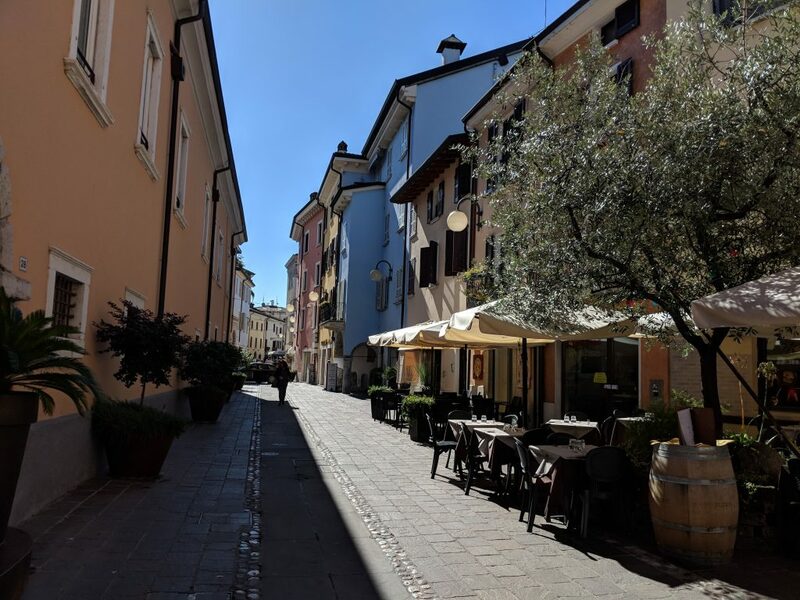 The town of Sirmionie is a good mix of tourist shops and restaurants, cute Italian bars serving Prosecco and cichetti (snacks) and cultural sites like the Grotte di Catullo which are the remains of a Roman villa and Rocca Scaligera medieval castle. The castle here offers some of the best views across the lake but involves climbing a lot of stairs. Entrance to Scaligera Castle costs 6 Euro or as a combination with Grotte di Catullo, 10 Euro. 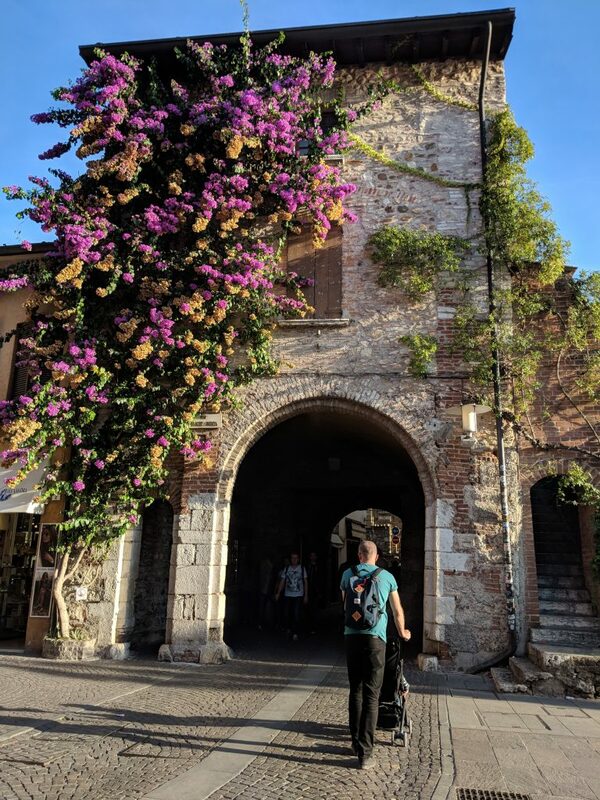 The main village of Sirmione is really pretty with cobbled streets, quaint passageways and medieval buildings draped in rainbow wisteria. It’s an easy place to walk around and time-permitting we could easily have spent the whole day here. There are restaurants all over but we didn’t dine anywhere particularly special to speak of. Most of the places all seemed very similar, serving the same dishes at the same prices. Sirmionie is probably the busiest and most popular village (for good reason) so choose to either go first thing in the morning or late afternoon because it becomes very packed after midday. 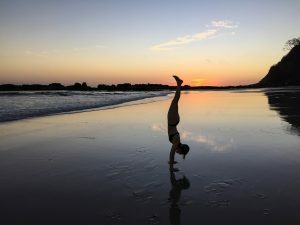 We opted for the latter and found it a delightful place to explore until dusk, finishing our day watching the sunset at the harbour with a glass of wine as we waited for the ferry home. 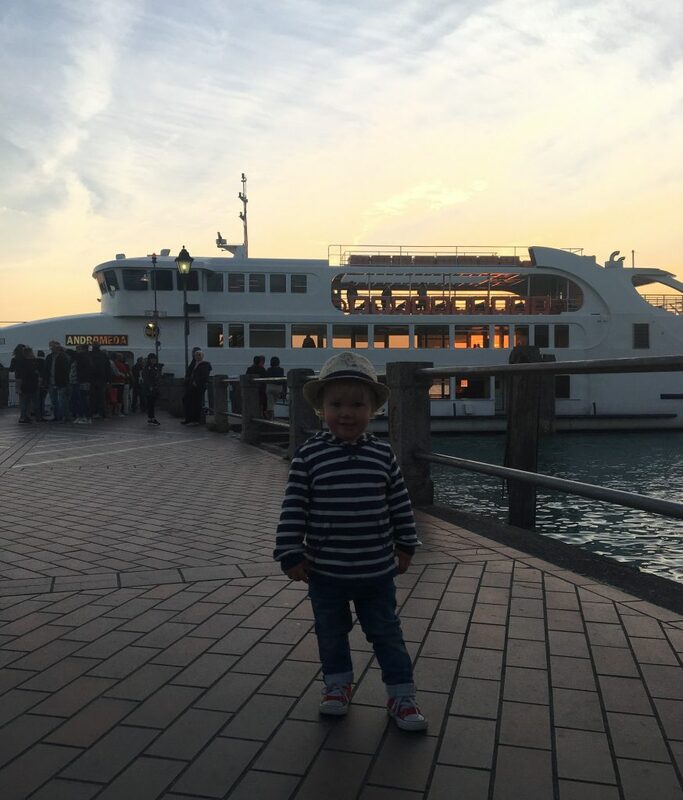 Don’t miss the last ferry! 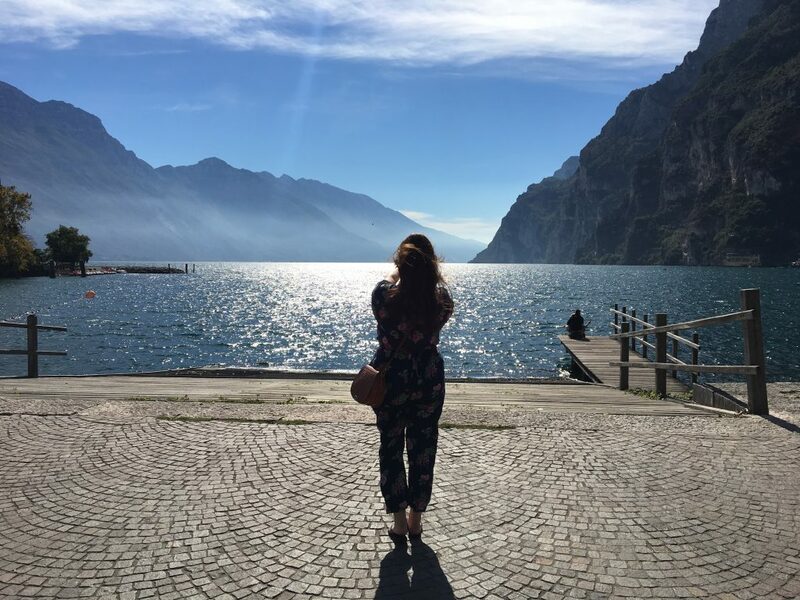 Are you enjoying our guide to Lake Garda and finding it helpful? If so, we would really appreciate a shout out on Twitter and a follow on our Instagram. Support on social media helps us to continue producing helpful and detailed destination guides and reviews. 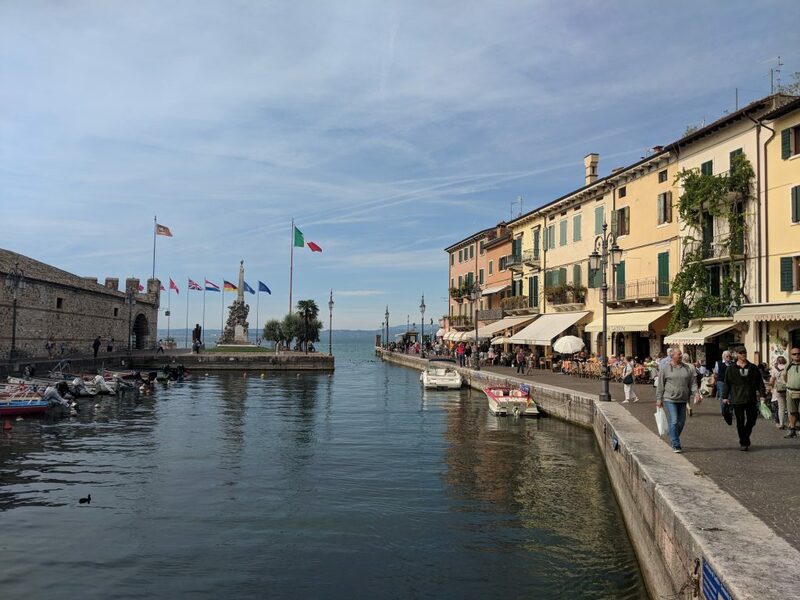 If you are looking for the best villages to visit in Lake Garda, Lazise was another place we really liked. I don’t know about the official sizes, but Lazise felt smaller and more compact than some of the other villages. However, it has a long promenade which is ideal for cycling, walking, rollerskating and dog-walking along the lake. The tree-lined coastal path offers plenty of shade and has benches all along to stop and enjoy a picnic. We also saw people jumping into the water from the rocks and peacefully fishing. Once you hop off the ferry, the port and harbour has a pretty seating area with cafes along the water. 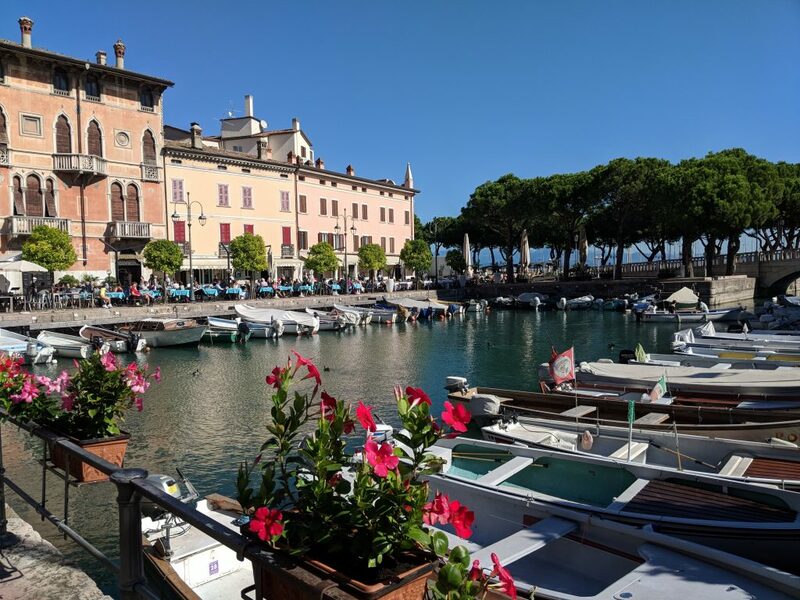 We decided to go to Lazise in the morning but I would actually recommend Lazise around lunchtime as it seemed less populated with tourist groups and there were lots of restaurants that looked ideal for lunch – but we were not hungry enough! The one I really fancied was called Ristorante La Terrazza del Boff which had a terrace and a delicious looking menu. 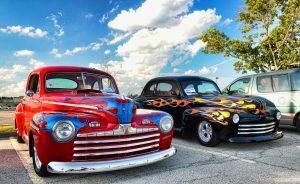 One for next time! The following day we decided to drive and explore the northern part of the lake. The drive from Desenzano to Riva del Garda was just under 1hr 30 mins and there were plenty of places to park. 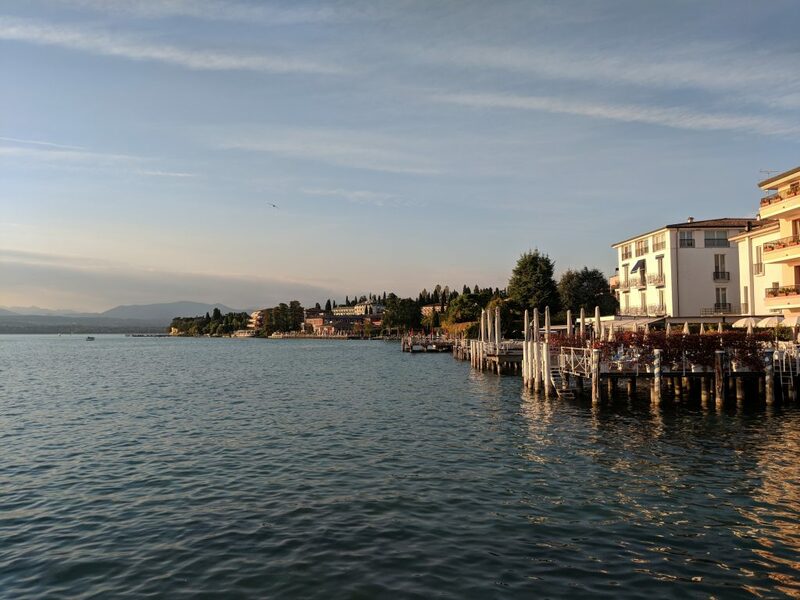 As we didn’t know much about Lake Garda before we started doing our research, in my mind I expected it to be much less populated around the lake and similar to our trip to Lake Tahoe in California. 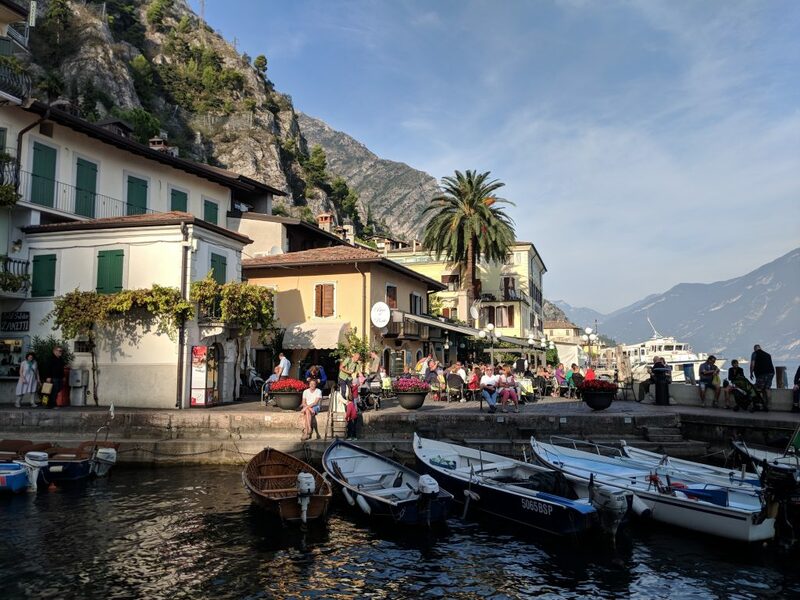 The choice of beautiful Italian villages around Lake Garda was actually a pleasant surprise and another great reason to visit, but when we arrived in Riva del Garda, I finally got a taste of the lake experience I had been expecting. 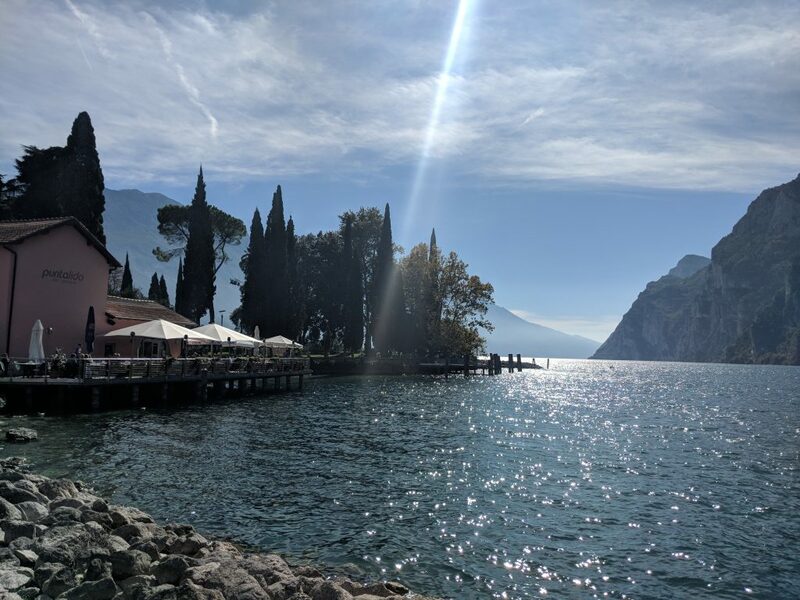 This north area makes up the Trentino, fjord land of Lake Garda and it is surrounded by the alps, making it our number one beauty spot in Lake Garda. 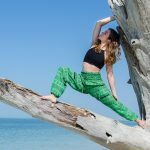 We love to be outdoors and explore nature and this was the perfect place to do that. 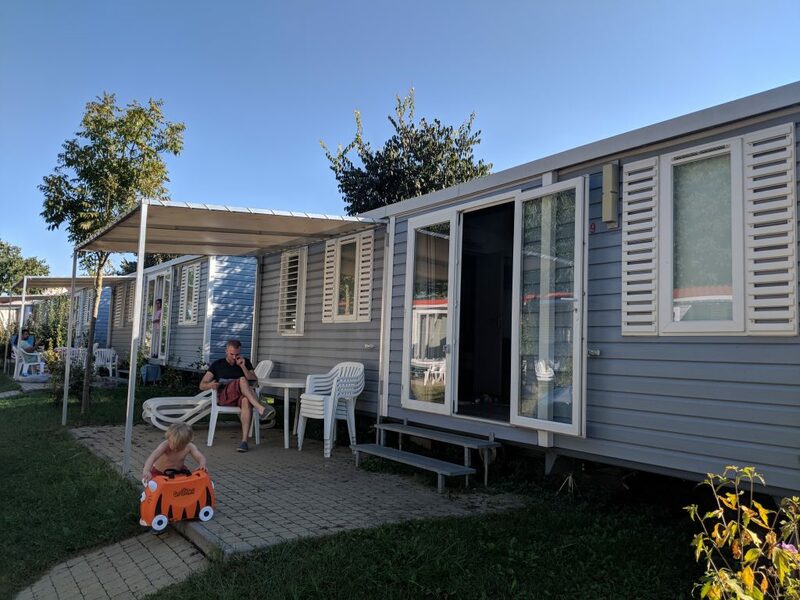 We parked at the large car park by the tourist office and next to this was a huge recreational area, including a beautiful park, beach, roped off swimming pool in the lake and a sprinkling of cafes. You could rent pedalo boats, sailing boats and speedboats as well as other watersports such as stand up paddle boards, kayaks and jet skis. There was a big playground for Finn and a large grass lawn with people reading and socialising. Along the front there was also a designated cycle path and a choice of places to rent bikes for the hour / half day or whole day. There is also a big harbour with boat tours and excursions leaving from the pier. 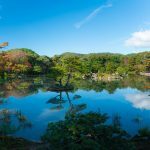 Or, if you prefer adventures on land, plenty of hiking trails and walking paths (ranging from easy to difficult) are listed as starting from here. 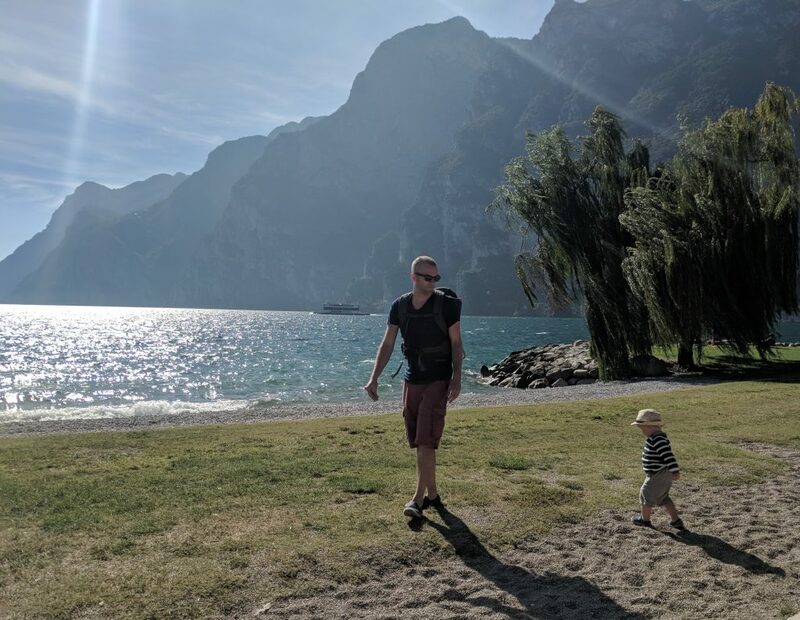 Next time we would consider staying in Riva del Garda as it was definitely our favourite place on the trip. 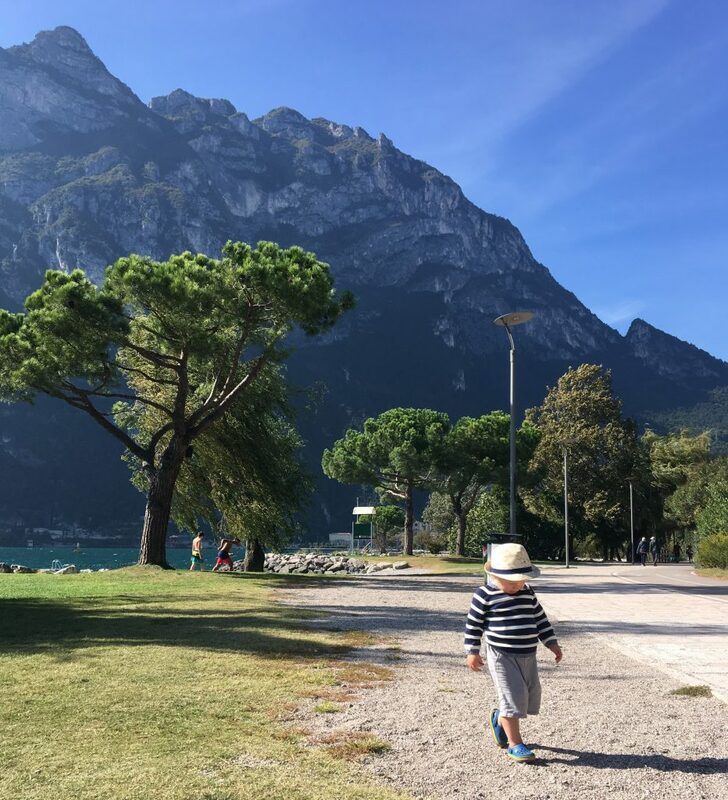 If you are visiting Lake Garda with kids, Riva del Garda is an ideal spot because there is so much space for them to run around and explore – plus fresh air and lots of activities. If you are going to different villages around the lake, eventually they can all start blurring into one and this was a welcome change. There is a village here too, of course, but we spent all our time on the waterfront. One of the things we do recommend going into the village at Riva del Garda for is ice cream! The large Gelateria Flora gelato parlour is on the edge of the town and was some of the best we had in Lake Garda. 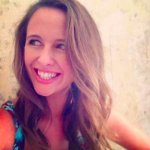 Need help with geography and looking to incorporate Lake Garda into another Italy trip? 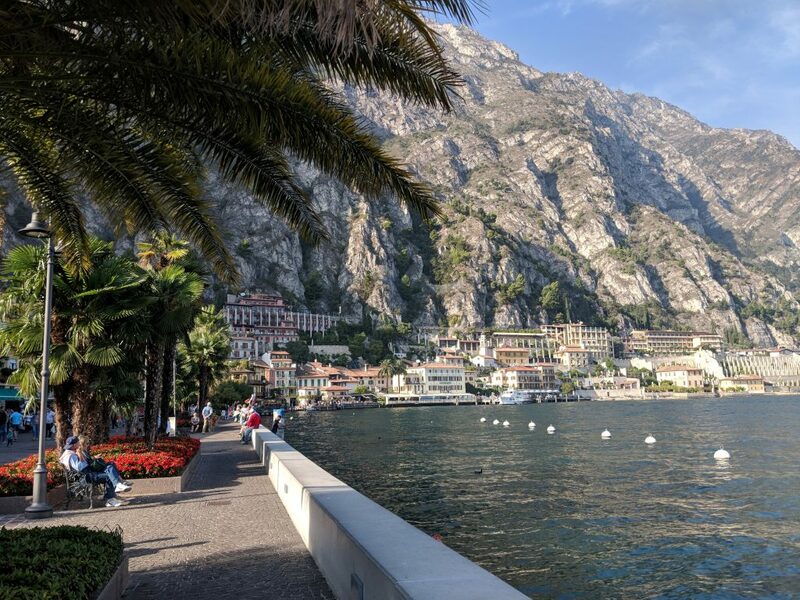 Riva Del Garda is a three hour drive from the gorgeous Cinque Terre. 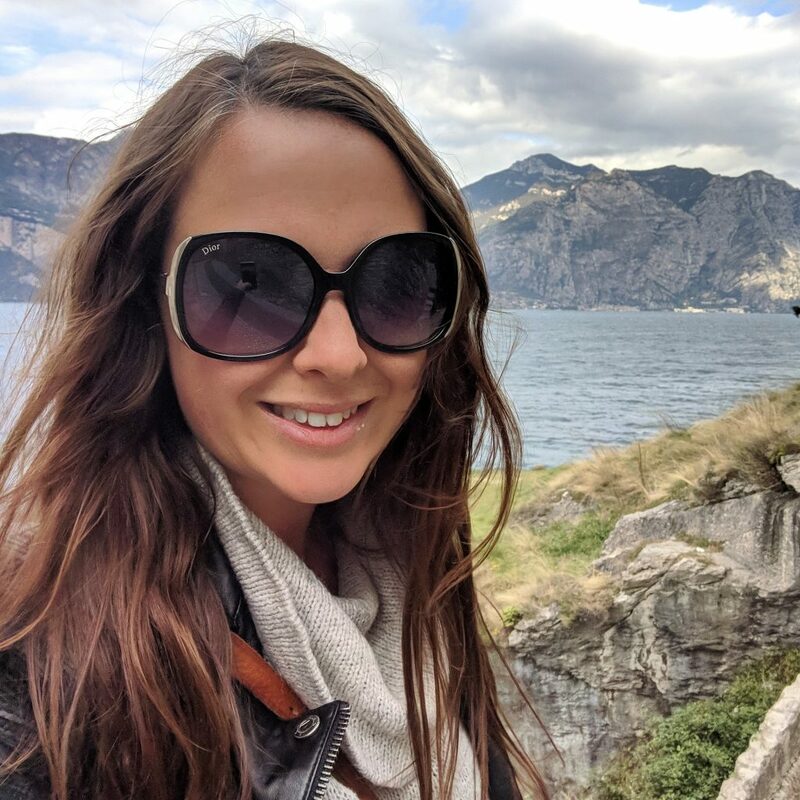 Another interesting thing to do in Riva del Garda is the WWI walking tour through the underground tunnels and bunkers built during World War 1. We didn’t manage to get this booked on this trip but some people we met said it was really good so it’s firmly on my to do list for next time. Just south of Riva del Garda, Limone was another village I would highly recommend for a visit. Again, like a lot of the other villages there is a long waterfront here with hotels, cafes and shops on the promenade. I liked this picturesque village a lot. There was a series of mini marinas as you walked down with fishing boats and wisteria-draped buildings decorating the ancient cobbles. 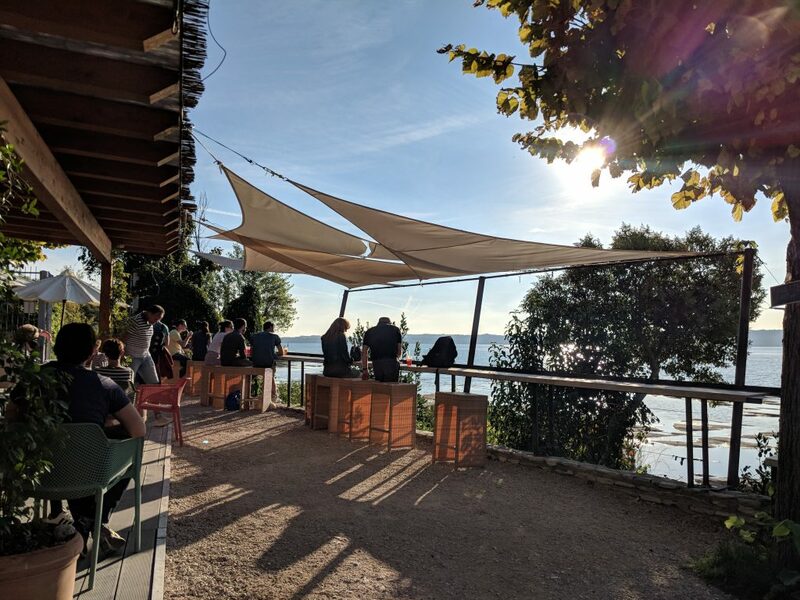 This would be the ideal place to come for an early morning stroll or an evening with friends for a few drinks and a casual dinner, putting the world to rights as the sun goes down. There isn’t even that much to say about Limone to make it stand out from the other villages – I just liked it! As places go, this one just seemed cooler than the rest and had a good vibe. 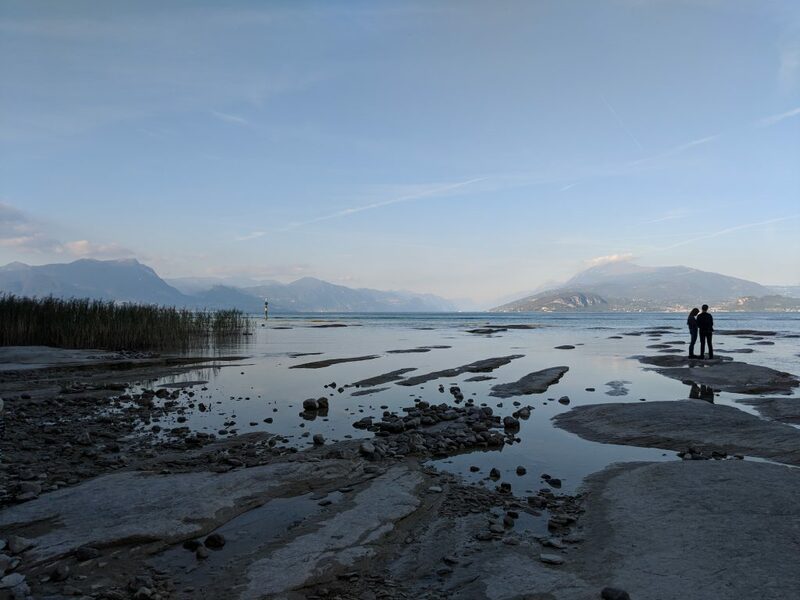 If you are exploring Lake Garda by car, the drive along the west side in particular is really beautiful. The main road weaves in and out of the mountains through tunnels and narrow bridges. The stretch between Limone and Maderno has a designated cycle and walking path so is also a great place to stop off and stretch your legs. Along the walking path I spotted my dream apartment. A glass-fronted flat, jutting our over the lake with perfect views and a roof to sunbathe on. When I win the lottery you will find me here. We didn’t spend long in Toscolano Maderno, a cute fishing village on the west coast between Limone and Gardone. I don’t think this is considered to be a huge tourist spot but we had been given a restaurant recommendation here and it turned out to be a good one. Il Cortiletto is a casual but classy restaurant on the corner of the harbour. The food (especially the curry bread) was great and they were very accommodating to us with our toddler. It probably is a tourist-friendly restaurant but it felt authentic and I really liked the friendly staff and the relaxed Italian feel. 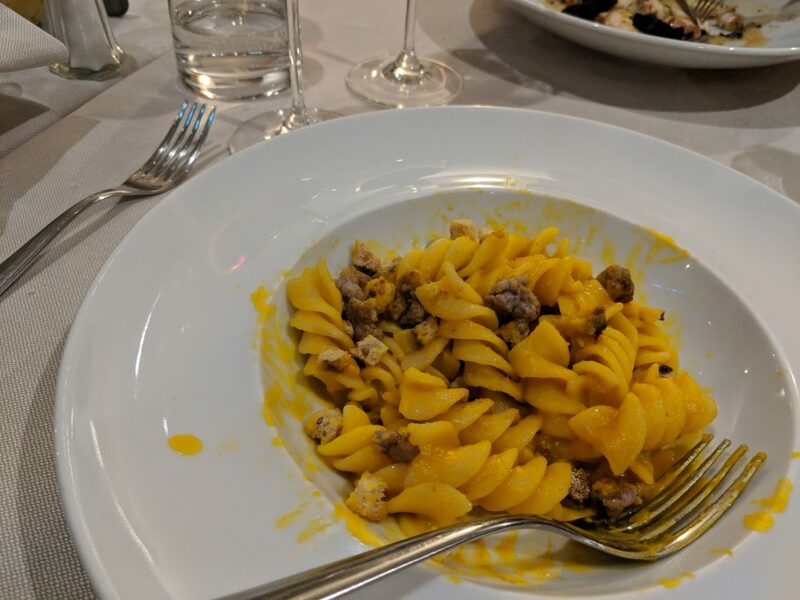 As a side-note, maybe we chose the wrong places or maybe Lake Garda isn’t really celebrated for its food but this was the only trip to Italy where I didn’t leave disappointed we couldn’t eat more. The food was good, as a whole, but it just wasn’t as memorable as some of the dishes we’ve enjoyed in other places such as Florence and Venice. Il Cortiletto was one of the only restaurants I bothered to write down as a recommendation. 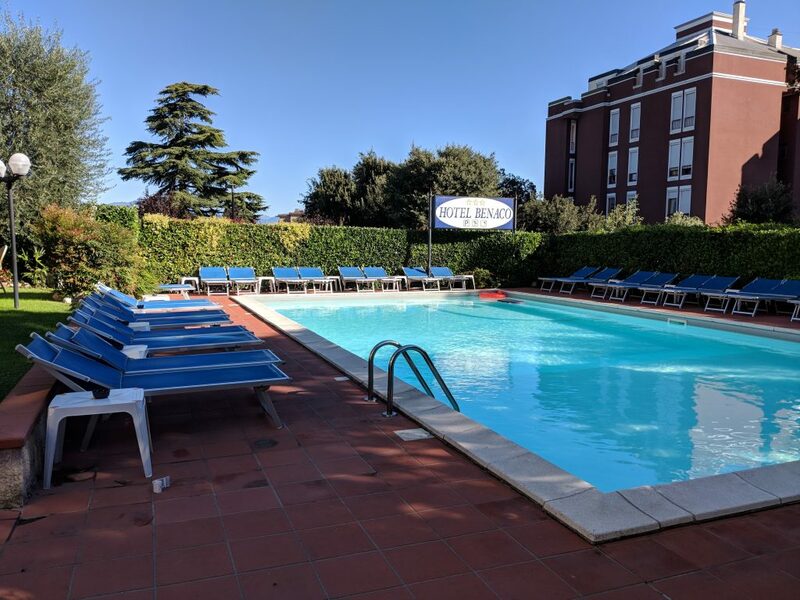 After three nights in Desenzano, we moved to Peschiera and stayed at the Campeggio Del Garda holiday park. 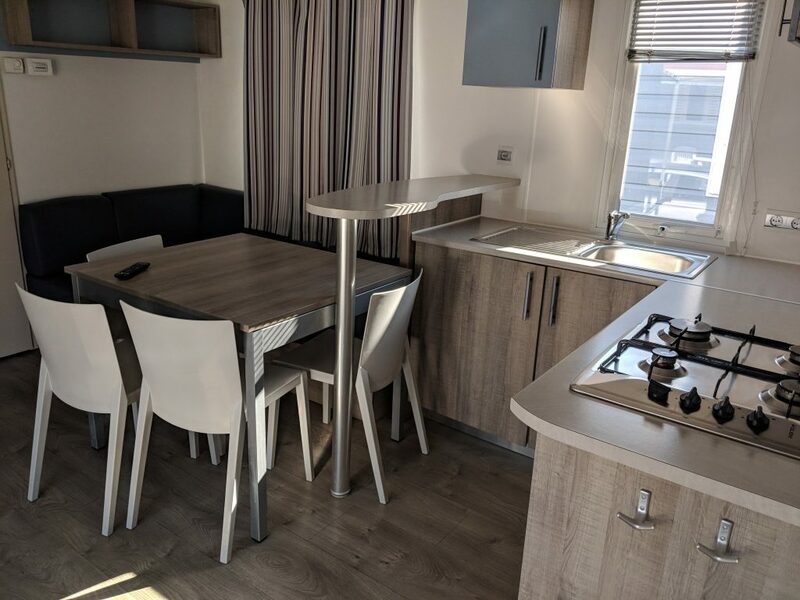 This holiday village was a great place for a family stay. We had a three-bedroom cabin (£75 per night) and it was very clean and spacious. We only booked a two bedroom (£50 per night) but the resort gave us an unexpected upgrade. 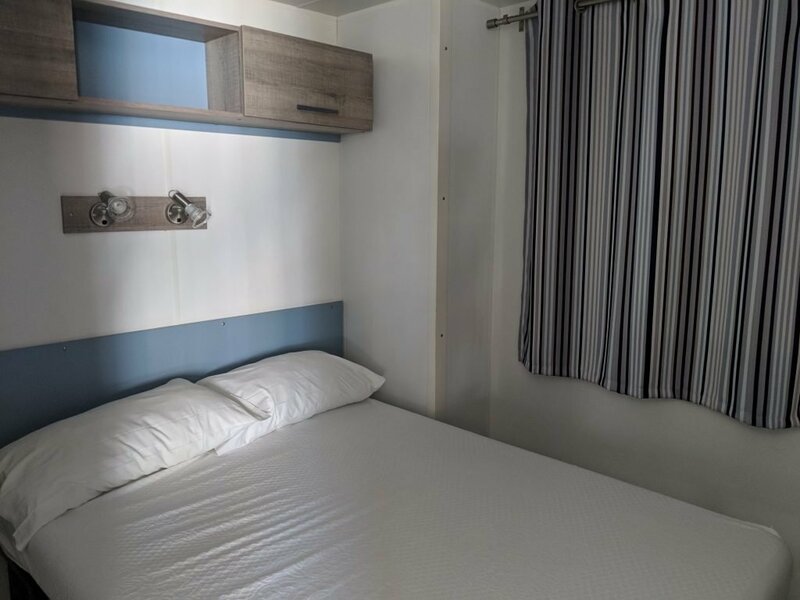 In reality, the three-bedroom was the best option as we could use the third, unused room to unpack and spread out our stuff, keeping the rest of the cabin tidy. Even if we had paid the extra money to upgrade, I think it is worth the extra spend. The camping village was in a quiet corner, next to the marina and beach. 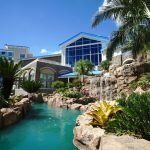 There are two large pools (one for kids with three fun slides and water features). There is a decent pizza and pasta restaurant on site and a basic bar. 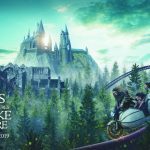 At the reception desk you could rent bikes and also book tours (including to the nearby Gardaland theme park). We didn’t go but it looked brilliant! The site itself was very peaceful and there was a lot of space for campervan parking and tents. This area in particular can get very busy during summer weekends with Italians coming to enjoy the beach and water. In August, the area plays host to the Palio delle Mura boat race, drawing big crowds. During our visit, Peschiera was calm and quiet. Much like Riva del Garda, watersports, sailing and riverside relaxing seemed to be the order of the day. 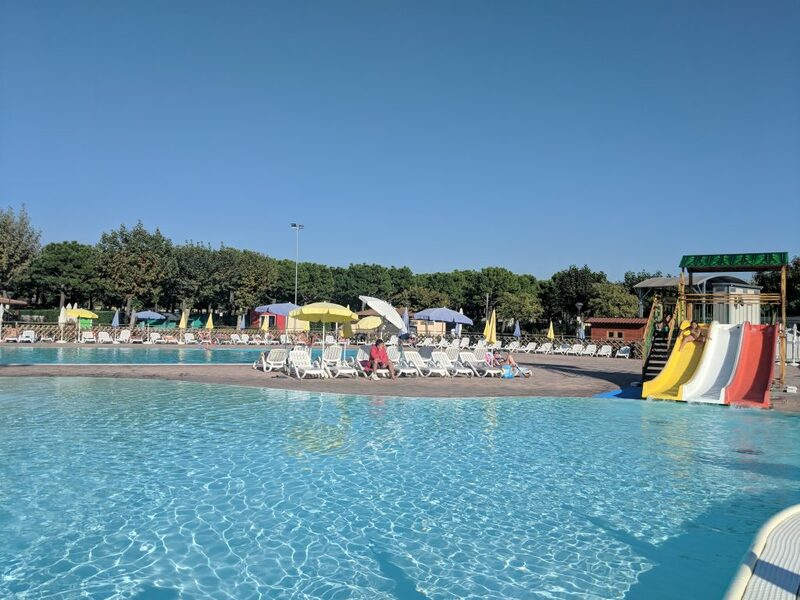 The area is ideal for families, especially due to the number of decent campsites here and distance to Gardaland as well as the Movieland theme park and Sea Life Centre. After a busy week exploring the lake, we actually didn’t do much here except enjoy our campsite and wander around the marina. Lots of people were cycling or walking dogs on the waterfront and we felt like locals for a while, just pottering about in the sun. From here, we explored the last two main villages around the lake by car. Malcesine is one of the most popular villages around Lake Garda but, personally I wasn’t a big fan. I found it very busy, packed with tourists crowding into the narrow streets. Plus, the stone cobbles made pushing a pram very difficult (for those with kids). Another annoyance here were many of the lanes and passageways lead through to dead ends so we spent a lot of time getting lost and having to walk back along the same path. The centre point of Malcesine is the Scaliger Castle which sits atop a large hill and dominates the landscape. The cost to enter is 6 Euro per adult but inside isn’t quite as impressive as viewing the castle from the outside. The ice cream shop at the castle gates came highly recommended so we chose a gelato and decided to skip the inside tour. The top of the clock tower inside the castle does give fabulous 360 degree views but even without entering, you can walk outside the castle walls and get wonderful, panoramic views of the town and the lake. The thing I did like about it was that it felt very Game of Thrones – but if you follow me on social media you’ll know I’m sad like that. 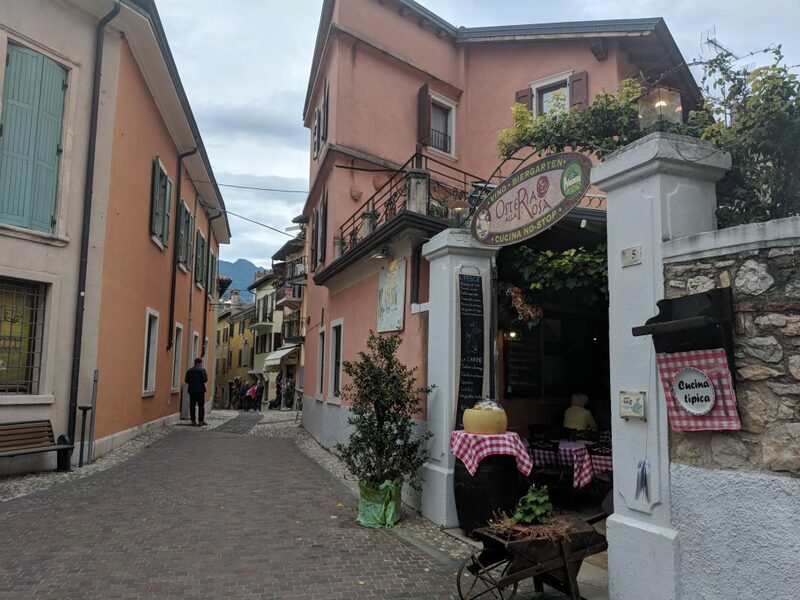 If you’re looking for somewhere to eat in Malcesine, on the edge of the town is the Osteria alla Rosa, a cute cafe with outdoor seating and satisfying (‘grandma’ recipe) pasta dishes. If you escape the town, take a walk south along the water edge. This is mainly a residential area but there are quiet vistas, green areas and little beaches that you’ll almost get to yourself. 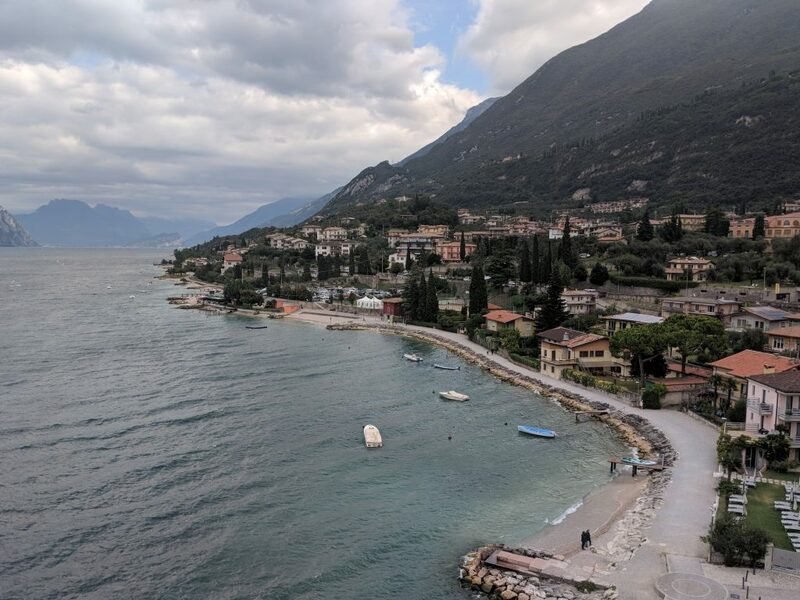 Near to Malcesine and worth taking some time to ride is the Monte Baldo cable car Gondola for fabulous views of the whole of Lake Garda (it only operates between March and October so we missed it by a few days, sadly). 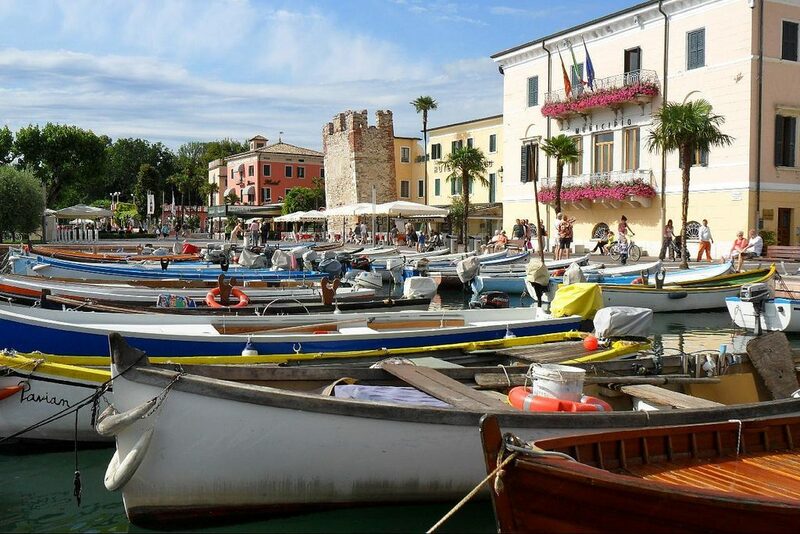 Garda, by its name, is one of the main towns around the lake and we noticed this is a popular area for coach transfers to drop off and pick up. 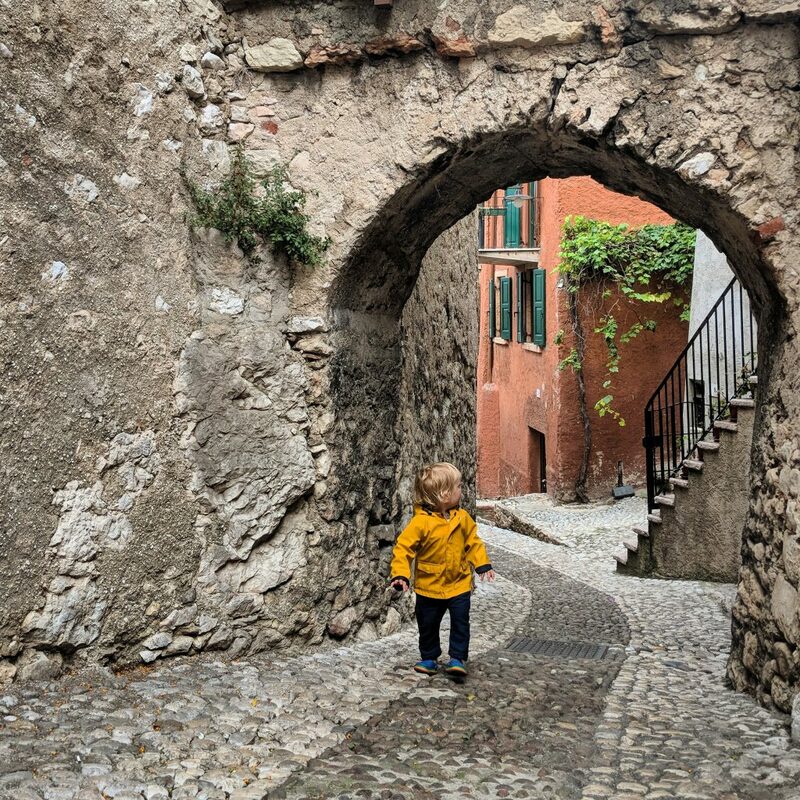 We actually had a lovely time in Garda but it isn’t the prettiest of the villages and was very touristy – almost entirely made up with restaurants, bars and hotels. Garda also had one of the biggest and busiest harbours we came across but that also meant lots of space around there for crowds so it never felt packed. There were a few cute areas, in particular these little piers along the front where you could sit inside and feed bread to the ducks on the water below. Finn, of course, loved that! The weather had started to cloud over by the time we got to Garda so we didn’t do much here. Garda is a nice place but if you are short on time I think one of the other villages would be a better choice to visit. We had a great time in Lake Garda. It was brilliant to see a different side of Italy’s personality and see the incredible lake in all its glory. Going to Venice? DON’T DO THIS. 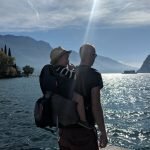 A week itinerary for Slovenia.